I currently have about four stacks of books and magazines in the living room. Just stacked in places like on top of the DVD player (yes people still use those! ), on a tall lidded basket thing, but mostly right on the floor. There is also a stack in my bedroom, right next to my desk. I've heard it's bad to keep heavy things on top of a printer but it's still in working order so I'm going to pretend that means everything is fine. It's not a bad look actually, the stacks are neat and they give a certain coziness to the space. But I digress. 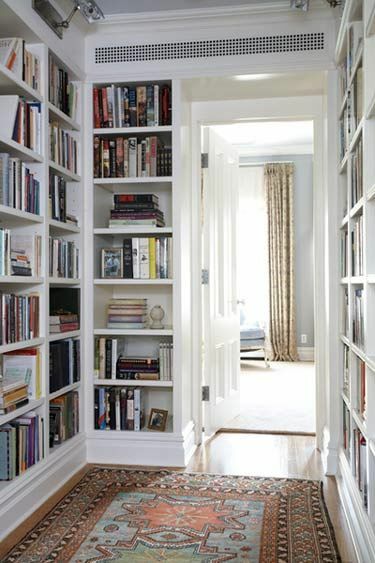 The fact is, I wanted to share a few of my favorite images of built-in bookshelves (which are all on my Pinterest for safe keeping). 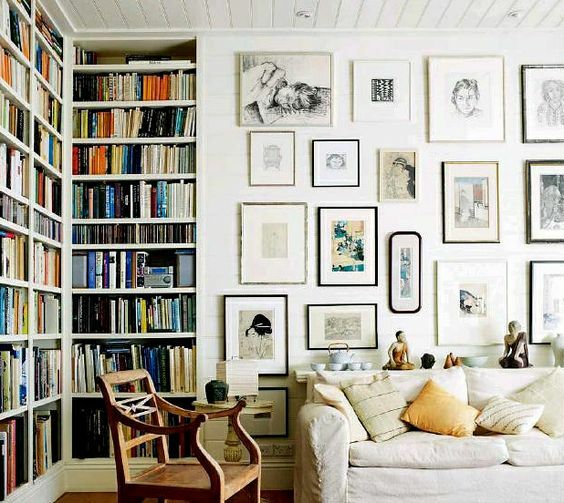 There's a certain sophistication about built-ins, isn't there? I hate to be cliché but they lend a certain je ne sais quoi. They add so much to the skeleton of a room really, as a part of its innate character rather than its decor. They make you feel something. I mean, right now they make me feel like I should have a bookshelf for all of my books but that's not actually what I mean. Just look! First of all, corner built-ins are insanely cool, and I love that it's filled to the brim with books. 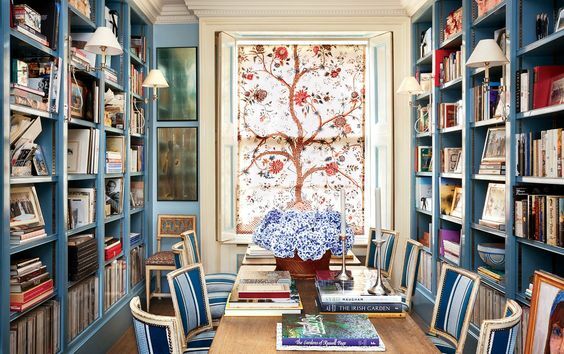 But then, built-ins in the perfect shade of blue to line your beautiful dining room? Unexpected and very attractive. My favorite. Those shelves in the hall though: genius. That hallway is not the least but boring or predictable. I have to admit that I find family photos lining a hallway isn't very exciting. Bookshelves though? Always. And finally, built-ins that aren't built-ins. For us non-homeowners. They certainly fake it quite well. I think they look great, especially because of their molding and the detail of the lamps. Consider me inspired.